I am, if I’m being entirely honest, not a natural when it comes to carving. It is one of those Bushcraft skills which I need to work on. The fact that I find it challenging strengthens rather than diminishes my will to improve, and also heightens the enjoyment and satisfaction I feel when I carve something that I can be proud of. I put down my knife and finish sanding my second Kuksa, a traditional wooden cup crafted by the Sami people of northern Scandinavia (my first attempt didn’t quite turn out as planned – my wife now very kindly refers to it as the ‘olive dish’!). I can remember the pride with which I took home my first carved spoon after attending the Fundamental Bushcraft course back in 2010. The fact that the spoon was not very good (misshapen and not symmetrical!) didn’t matter. I had toiled over it, sweated and bled (a little! ), and eventually after several hours of sawing, carving and last-minute sanding produced something that, for all intents and purposes, resembled an eating implement… okay then, a spoon! 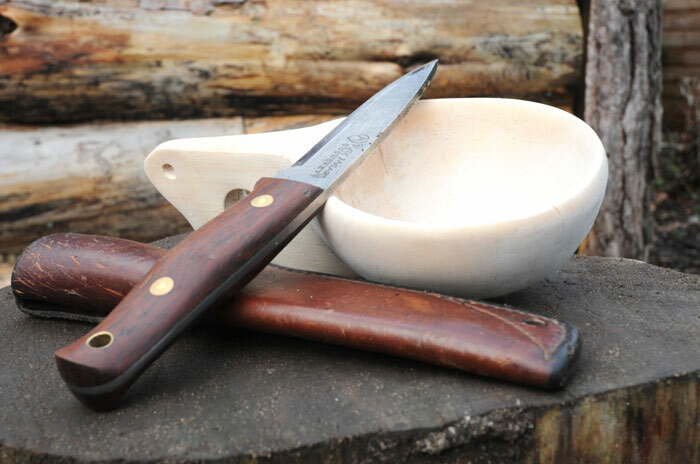 This entry was posted in Bushcraft Courses & Expeditions, The Woodlore Team and tagged bushcraft, Camp Craft, Carving, courses, fundamental, knife, Kuksa cup, Mark Booton, Master Class, saw, swedish, traditional, wooden cup, woodlore on June 13, 2014 by Woodlore Limited.